My other co worker and I shared the Roast Lamb. 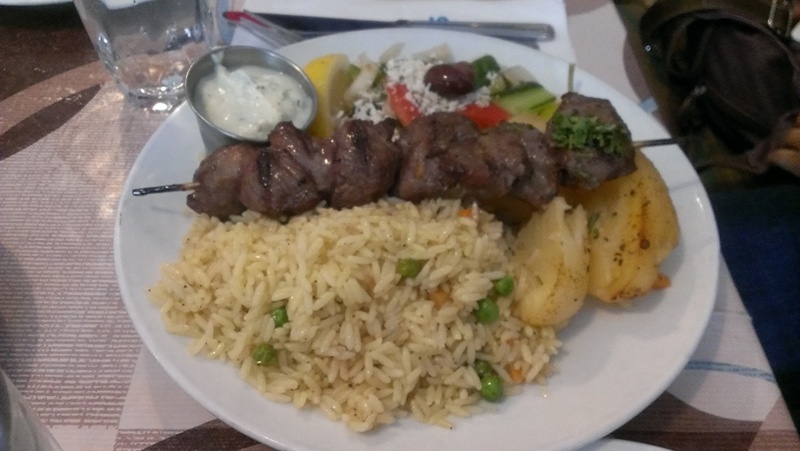 This dish was a bit more expensive than the souvlaki dishes but it was worth it! 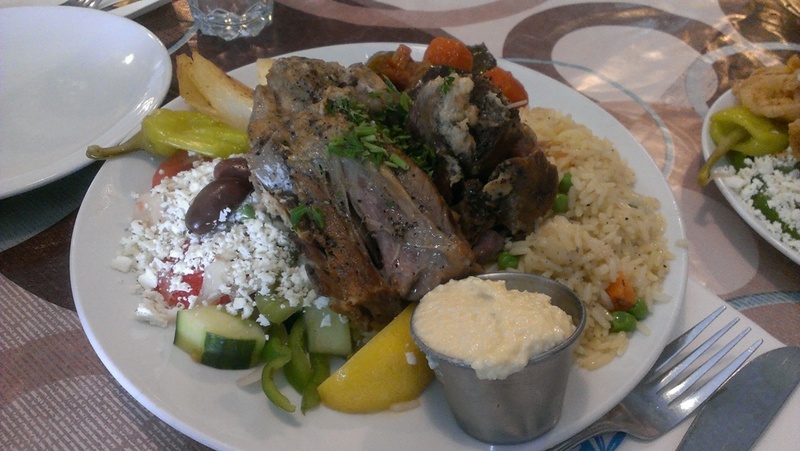 We had a huge portion of tender roast lamb served with some stewed vegetables and the usual rice pilaf, roasted potatoes and Greek salad. We also ordered a side of garlic sauce instead of the tzatziki dip. The lamb was very tender and flavourful and there was enough for two people here! Well two girls who don’t eat that much anyway. Also, the garlic sauce was super garlicky! Be prepared for garlic breath after! But it did taste good with the lamb. Since we got the garlic sauce they didn’t give us the tzatziki dip for the salad though. The rice and potatoes and salad are nothing special but they’re just meant to fill you up. I tried some of my co worker’s Baklava because she really wanted to try a Greek dessert (there’s always room for dessert right?). 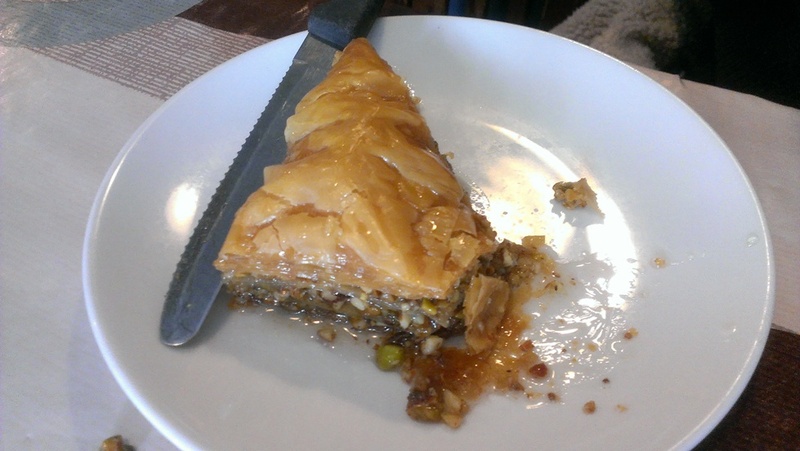 Since I’ve only had baklava once before I can’t really comment much but Stepho’s version was really sweet it was oozing with honey like sauce. It probably would’ve been too sweet if I had eaten the whole thing. The layers of flaky pastry were also drenched in sauce making them not so flaky after all and the layers kind of separated when you tired to cut it too. The nutty middle layer offered some texture though. One more thing, our food came SO FAST. Like literally within 5 minutes of ordering… O___O I guess everything is already pre-made in large batches and they just scoop it out and plate it? It was obviously not freshly made but we didn’t mind much. 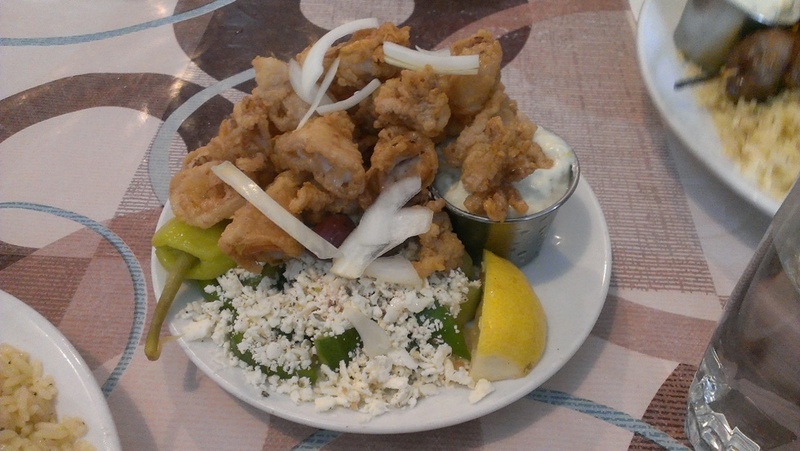 I don’t really eat Greek food often but I’m sure there’s probably better Greek food out there. I haven’t been here in a while because I didn’t think it was worth lining up for but it’s cheap and filling for sure. Go for lunch to avoid line ups!